Besides regular toothbrushing, your child's diet will play a key role in his dental health. The longer and more frequently his teeth are exposed to sugar, the greater the risk of cavities. "Sticky sugar" foods such as sticky caramel, toffee, gum, and dried fruit—particularly when it stays in his mouth and bathes his teeth in sugar for hours—could do serious damage. Make sure to always brush your child's teeth after a sugary food item. Do not allow young children to have any sugar-containing liquid in a sippy cup for a prolonged period. See How to Prevent Tooth Decay in Your Baby. 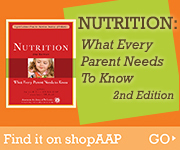 Almost everyone naturally enjoys sweets, and your child is no different. Like other human beings, she was born with a taste for sugar, and she's already quite sensitive to different concentrations of sweetness. Offer her a yam and a baked potato, and she'll take the yam every time. Give her a choice between the yam and a cookie, and the cookie will win. Rest assured, it's not your fault if she makes a beeline for the candy and ice cream when you'd rather she take a piece of cheese. But it is your responsibility to limit her access to sweets and to provide a diet made up primarily of more nutritious foods that promote growth, not tooth decay. Television advertising, incidentally, can be a serious obstacle to your child's good nutrition. Some studies show that children who watch over twenty-two hours of TV per week (over three hours of screen time a day) have a greater tendency to become obese. Children are extremely receptive to ads for sugary cereals and sweets, especially after they've visited other homes where these foods are served. Obesity is a growing problem among children in America. For this reason, you need to be aware of your young child's eating habits, at home and away, and monitor them to make sure she's eating as healthy as possible. To combat outside influences, keep your own home as healthy as possible. Stock up on low-sodium, low-sugar, and low-fat products. Eventually he'll become accustomed to healthful foods, which may make him less susceptible to the temptation of the more sugary, salty, or greasy ones.